1) Highest unpaved road Europe: Col de Sommeiller. 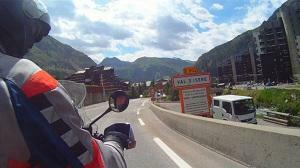 This road is located in the Italian Alps just above the Frejus tunnel. Originally it was build in 1962, giving access to a large ski area, but after melting of a big snow glacier the road is since 1980 no longer in use. The total climb is covered with rocks and greffel and ends at 3009 meters. The final summit at 3050 meters is only accessible on foot. 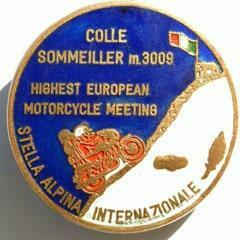 Every 2nd Sunday of July the Sommeiller is the centre of World's highest motor meeting, the Stella Alpina. 2) Highest paved mountain pass Europe: Col de l'Iseran. With its 2770 meters the Col de l’Iseran is the highest paved mountain pass in Europe. 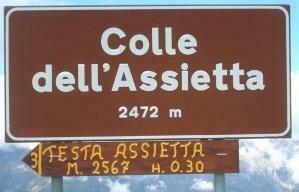 The Col is named after the area l'Iseran which is named after the river Isère. The river originates in the valley at the luxury ski resort of Val d'Isère. Despite the famous reputation of the Col, you find only one small bar/restaurant on the summit. On the south side there are beautiful views of the mostly snow-covered Vanoise Park. 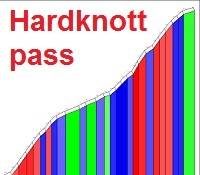 3) Steepest road Europe: Hardknott pass. Only 393 meters high, but a serious climb. Because the road is a single-track there is no place for oncoming traffic, resulting frequently in stopping and backing up. With a climb of 30% this is not always easy... The road was completely destroyed during the Second World War by English tank training and after the war completely repaved with tarmac. On a clear day there are spectacular views at the top of the summit including a beautiful view on the Isle of Man. 4) Most winding road Europe: Col de Finestre. In the Italian Cottian Alps, road workers were able to put 30 hairpin bends in less than 3 km. The total climb is over 18 km and ends at 1694 meters altitude. After the summit the road continues unpaved to the Assietta border ridge. Originally the road is built around 1700 giving access to the largest fort of Piedmont (Fenestrelle Fort 1,300,000 m²). Since 2004 the road is partially paved because of the arrival of the Giro Ditalia. 5) Best driving road: Transfagarasan highway. 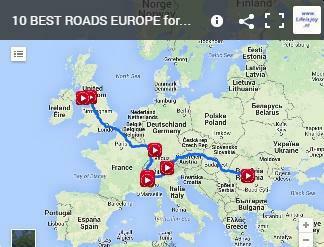 The TV show Top Gear has awarded this road with the title: “World best driving road”. The asphalt winds 90 km between steep cliffs true the highest parts of the Southern Carpathians and ends at the summit at 2034 meters. 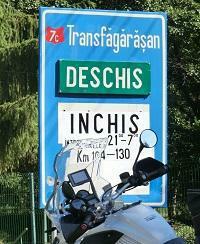 The road was build by the Romania army in 1970 after Russia invaded the neighbouring country Czechoslovakia. The views are breath taking, but the asphalt is for motorcyclists unfortunately not so good, with many potholes and broken tarmac. 6) Best preserved border road: Assietta. This road runs 60 km along the French / Italian border with more than 40 km original unpaved greffel. The highest point is 2472 meters, where you can have beautiful views over the Col de Sommeiller. Already in 1747 this military border ridge played an important role during "the Battle of Assietta". During a bloody war the former kingdom of Sardinia prevented an invasion of the French, resulting in more than 5,000 soldiers killed in 4 hours. 7) Most famous mountain road Europe: Stelvio. Before the Transfagarasan was awarded with the title "World Best Driving Road", the Stelvio did defend this title for many years. For motorcyclists it is perhaps still the best driving road because the Italian asphalt is perfectly repaired every year. Overall there are 48 numbered hairpin bends climbing to an altitude of 2757 meters. The summit is open from June to September and always pleasantly crowed. 8) Most iconic circuit road: Mountain course. During the Isle of Man TT, the entire public ring road on the island is transformed into a circuit. One of the finest roads here is Mountain course were the maximum top speed is reached between deserted hills. During the TT sheep are literally put in to barns and cats and dogs are locked inside the homes. Even weddings and funerals are cancelled so that the races can continue. Isle of Man and Mountain Course are legendary for every motorcyclist. 9) Oldest themed scenic road: Schwarzwaldhochstraße. Already in 1930 the Schwarzwaldhochstrasse was officially themed as “scenic road” by the tourist board of Germany.. At that time the road only ran between Hundseck and Untersmatt, but later it was extended to 45 km from Kniebis to Baden-Baden. Although there are indeed amazing scenic landscapes, the Schwarzwaldhochstrasse (B500) is best known for its high speed driving pleasure. The wide open views and the perfect clean asphalt give the feeling of a circuit. 10 Oldest ancient Roman road: Wrynose pass. At the beginning of our era the Romans had build more than 400,000 km of roads in Europe. One of the best preserved roads is the Wrynose pass in the Lake District National Park in Cumbria. The road winds more than 10 km along the River Duddon, ending at the ruins of the Hardknott Fort. This Fort was built between AD120 and AD138 and is giving a spectacular view over the pass. Videos from this trip: Click here. A message in our guestbook: Click here. For more information send an e-mail: Click here.